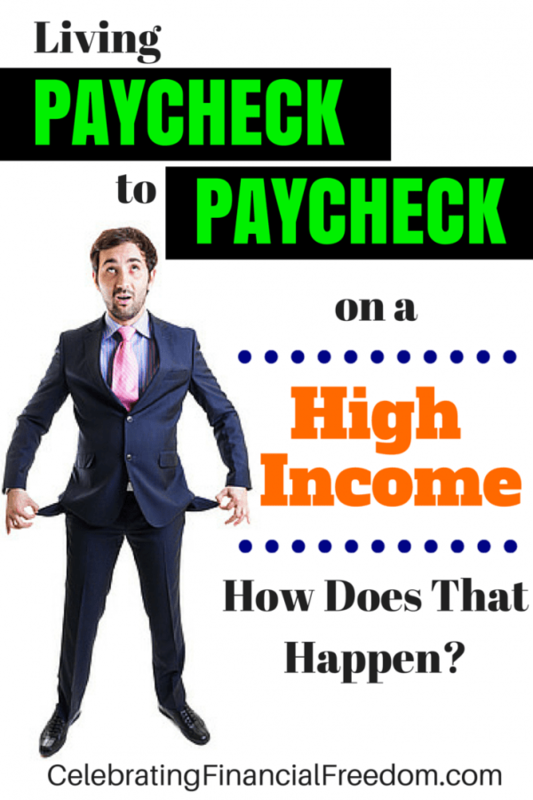 Living Paycheck to Paycheck on a High Income- How Does That Happen? You are here: Home / Manage Money / Living Paycheck to Paycheck / Living Paycheck to Paycheck on a High Income- How Does That Happen? This is the first post in the Living Paycheck to Paycheck on a High Income Series. Studies show that approximately one third of those with a high income are living paycheck to paycheck. How does that happen? In a country where two thirds of all families are living paycheck to paycheck, I guess that shouldn’t be much of a surprise. I realize that the cost of living has been increasing more than salaries for the last decade or so, but shouldn’t the high income earners (over $75,000) be immune to the paycheck to paycheck lifestyle that is more prevalent among middle and low income families? Read on and I’ll show you why earning a high income doesn’t necessarily eliminate the paycheck to paycheck life and what you can do about it. Will More Money Solve the Problem? I’ve heard many times over the years from people who are living paycheck to paycheck that if they just made more money, all their problems would be solved. When they make that statement, it shows me that they really have a complete lack of understanding of their situation (in most cases). The problem that most people living paycheck to paycheck have is not that they don’t make enough money, it’s how they behave with money. It doesn’t matter how much money you make, it’s how you use it that counts. Just ask MC Hammer and Ryan Broyles what that’s all about. I’ve seen people making $40,000 a year live a very comfortable life with plenty of savings and no debt. I’ve also encountered people making hundreds of thousands of dollars who are financially desperate. They are literally one paycheck away from losing everything they have. The entire difference between these people comes down to the simple matter of how they behave with money. So if you have a household income that is substantially more than the median household income of $52,250, you are making enough money to live a comfortable life and save for retirement. The problem is that a lot of high income earners (as well as middle and low income earners) have fallen prey to the notion that enough is never enough. We’re bombarded with thousands of marketing messages that tell us we can have it all. Because we buy into that, it’s extremely easy to let consumer debt and wasteful spending pile up. For many people, it gets to the point that “having it all” includes a ton of stress, bills, collection calls, ulcers, and heart attacks. But that's not what our creator wants for us. When you have a higher income, lack of money is not what’s causing your problem, it’s the symptom. The real problem is usually inflated expectations and lack of financial discipline. At this point, you have to recognize that the main reason you’re making good money but still living paycheck to paycheck is you. You must understand that your mindset and actions when it comes to money need to change. You believe that debt is just a part of life- That mentality gets you into trouble very easily. Debt is not an inevitable part of life if you have the right mentality and a plan that goes with it. You’ve allowed luxuries to become needs- Eating out several times a week, luxury cars, designer clothes, and fancy trips are not necessities. They are wants. Convincing yourself that you need these things to live a happy life is self-deception pure and simple. It’s easy to feel entitled when you make a higher income. You overspend- It’s easy to justify spending on whatever you want when you have a high income. The problem is, if you don’t have a plan for how you spend money, a high income is never enough. You must have a plan (see below). You have a spending problem- You may have a lack of self control that needs to be addressed. This can be the result of conditions such as a shopping addiction, obsessive-compulsive behavior, or bipolar disease. You may need to seek treatment from a professional who can help you deal with these issues. Money is just too easy to spend- Credit cards and payment apps don't feel like real money. Swiping and signing don't hurt as much as using cash. Therefore you end up overspending before you even realize what you've done. You don't have a plan- No matter how high or low the income, most people end up living paycheck to paycheck because they don’t have a plan. When you don't keep close track of your money you will spend until the money runs out. Then you get your next paycheck and do it all over again. Without a proper plan you never really know where all your money goes. Making a high income is never a guarantee that you are immune from living paycheck to paycheck. Just ask any professional athlete that went bankrupt after making millions of dollars. When it comes down to it, you have to be completely honest with yourself. You’ll have to take a long, hard look at the reasons you’re living paycheck to paycheck and come to terms with them. Once you’ve figured out what the main culprits are, then it’s time to do something about them. In my next post, I’ll delve into how to change your mindset and habits when It comes to money. These will help get you started down the right path toward leaving the paycheck to paycheck life and finally succeeding with money for good!